If you want to truly enjoy all of what the Great Lakes have to offer, US Canadian border crossings are inevitable. The following information applies generally, regardless of whether you are Canadian or American, leaving or returning to your home country. Both countries maintain active surveillance on the Great Lakes. In fact, that was a central topic at a recent Maritime Security Conference that I attended in Toronto, ON. I have read remarks in sailing forums that suggest otherwise but common sense says that every country is going to use all methods possible to protect their borders. And this certainly applies to the US Canadian border. There is a Maritime Security Operations Centre, there is the joint Canada – US 'Shiprider' program whereby each country's patrol vessels have law enforcement officers from the other country on-board to eliminate jurisdiction problems, etc. In all cases, treat it seriously, have your proper paperwork on hand and be prepared to be asked to produce it when required. You have 'landed' in Canada when you enter Canadian territorial waters. You are not considered to have landed if you are “in transit”, defined as proceeding directly from 1 point outside of Canada to another point outside of Canada in a continuous, uninterrupted passage with no delays or stop-overs. You have 'landed' in Canada if you are weaving in and out of Canadian waters, for example if engaged in recreational fishing. You have 'landed' in the United States when your vessel first comes to rest in US waters, whether at anchor, at a dock or beached. It is also important to carry the ownership and insurance documentation of your vessel. If you have prescription medications in your medical kit, make sure you have copies of the prescriptions to match them. These documents can be carried in a waterproof case, available for inspection upon request. As Master, you are responsible for this. As a parent, you will likely have to organize it all for your family yourself anyways. 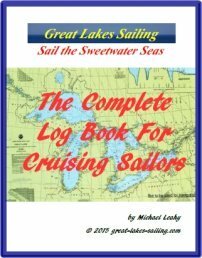 However, if you have guests on-board and plan to enter another country, it is only prudent to ask to see each person's documentation – I would hate to sail across one of the Great Lakes only to be turned back because someone didn't have their documents. Or worse, be accused of attempting something illegal and having my boat seized. It does happen and I suspect the expensive taxi ride home would be an unhappy trip as you contemplate what you have lost. Know what you have on-board. Normal consumables are no problem. However, customs and border authorities are concerned with smuggling which is alive and well on the Great Lakes. With reference to Canada, there are specific prohibitions on bringing certain firearms into the country. Nothing will slow down your entry into Canada as much as discovering that your guest has slipped a hand cannon into the bottom of his or her duffel bag. Each country has reporting requirements for large amounts of currency (CAN$10,000 and US$10,000). Failure to declare such amount can result in penalties including seizure of the money and possibly seizure of the boat. The best advice is to bring what you need and no more. Use a bank card as ATM machines are common. The Port Reviews list the closest bank or ATM to the harbour. Both countries have stringent laws regarding illegal drugs. Again, as Master, it is your responsibility to ensure that everyone on-board is in compliance with the law. Take no chances here. Personally, I have no problems speaking to a guest directly about this and, if I have any concerns at all, asking to see their kit. After all, its my boat on the line – and yours too! That said, seizure of your boat will be among the least of your problems if illegal drugs are found on-board. The purpose of these general remarks is just to have you think about some of the other issues involved when you begin to plan a cross-border adventure. US Canadian border crossings are not difficult or stressful - if you come prepared.